This manufacturer has expired. Here is other Floodlight you might be interested. Shenzhen Shengjing Optoelectronic Technology Co., Ltd.
What's the advantages of our 500W LED flood light? 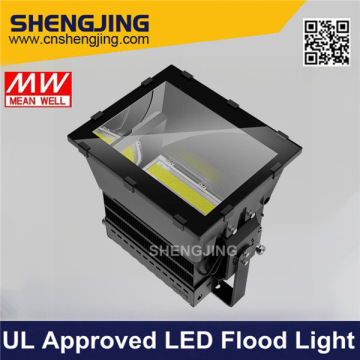 First, our 500W waterproof LED flood light is listed by UL, it is safe and friendly to the environment to use our product. Second, our UL listed 500W waterproof ED floodlights are manufactured using the newest and most up to date components available, adopt imported famous chip brand, CREE LED as the light source, high luminous output and good performance in heat dissipation; And the high quality high pressed die-casting aluminum shell and the fins design radiator with copper heat-pipes, transmit and diffuse the heat effectively, ensure a cooling working environment; Beside, by using the top brand driver, Meanwell LED driver (HLG series) which are UL CE TUV certified and waterproof, normally at -30° to +45°degree, adapt to continuous work easily. In addition, the cable we use is VDE approval and fireproof, ranked UL94 V-0. Third, we provide 100% quality test and waterproof test to our 500W LED flood light; and 5 years warranty provided and Product Liability Insurance covered, which is provided by the biggest insurance company in China,the PICC. So your business with us will always be safe (less than 2% of the company can provide this insurance)! 1. 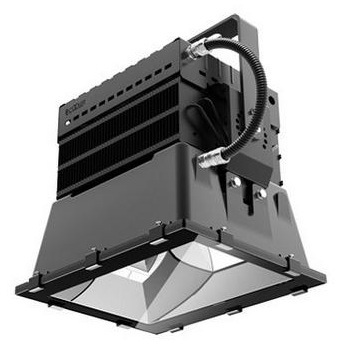 Special heatsink design, perfectly solved the heat dissipation problem of big power LED lamp, can replace 600W-1500W traditional sodium lamp and save over 2 times energy, filled the blank of the big power LED lamp market. 2. 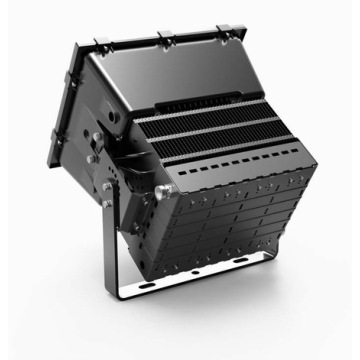 Innovative fin type radiator,light weight and better heat dissipation,easy to install and robust. 6. Long lifespan can reach 50000 hours. distribution, and can restrain the dazzle light and spill light effectively. by electrophoretic paint, and passed 200 hours salt spray test. 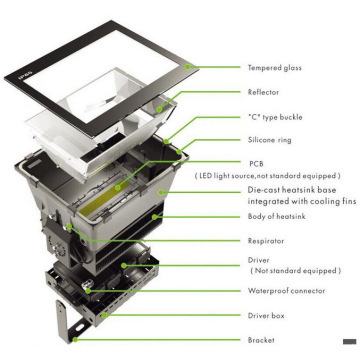 reducing the temperature of the leds rapidly and extending the lifespan. This inside high purity aluminum reflector is processed with anodization and polishing, optimize the lighting performance and restrain the dizzy light and spill light; square reflectors is also available:10*90 degree and 50*90 degree optional, meet the requirement of professional light distribution and can be used at different places. The good light distribution design 500W Waterproof LED flood light can replace traditional high pressure sodium lamp over 1000W, it can instant start, it has a very long lifespan and low consumption of energy,beside, it is polluting-free. It can be widely used at the stadium,golf course, wharf, square and any other places both outdoor and indoor. 1. Thick Caron box with foam inside to protect the rechargeable LED flood light. 2. Shipment: By sea, by air, by Express are available! We are a professional LED lighting company headquartered in Shenzhen, China, since 2007. 1. Certification: SGS IS09001 certified and most of our products have passed the EU, US, Australia and Japan certificates such as TUV, CE, ROHS, SAA, UL & PSE. 3. Main Products: LED tube, LED panel light, LED high bay & smart LED lightings. 4. Main Customers: Over 1000 retailers in China, 3 oversea distributors and contract supplier for one of the biggest American Electronic retailer. All our products are covered by PICC insurance, your business with us is safe! Contact us now! We are SGS ISO 9001 Certified and with a very strict and developed quality control system. We always take responsible for all the products we provide to our customers! We provide 3 to 5 years warranty and always try our best to provide a good services to all our customers! Why us? What's the reasons for you to choose us?! 1. Reply your inquiry in 24 hours. We are looking forward to build a healthy long-term relationship, and wish you success in your future business. For further detail, kindly contact us! Kindly contact us and send us your inquiry NOW! You can also send us your inquiry here and we will reply you within 24Hrs! 3-10 days for sample, and 7-30 days for bulk order after payment. Shenzhen Shengjing Optoelectronic Technology Co., Ltd. established in 2007, is an innovative enterprise specialized in development, producing and selling LED lighting products, our company’s products have obtained a number of domestic and foreign patent. We also have a group of engineers who is professional in optical, electrical and structural field, as well as some excellent electronic testing equipment to ensure high quality products.We focus on details in management, take the lead in the LED lighting industry through the ISO9001:2008 international quality management system, all our LED lighting products have passed the UL, VDE, TUV, SAA, CE, ROHS and other professional certification.We focus on the quality in the service; our products are selling well to Europe, America, Oceania, East Asia, and Southeast Asia more than 100 countries and regions. Some products are used in project of domestic and aboard government, have won many faithful customers trust.We focus on honest in the operation, we are rated A- credit by the Shenzhen administration of foreign exchange and China bank, and A-class taxpayers by the Shenzhen State Taxation Bureau, and we are also one of the Shenzhen LED Industry Association member units.We always focus on the pursuit of industry leading position, welcome your participation and guidance.